If you are out and about, and see these things, let me know! I am about mid-way through a crocheted blanket for P, and of course Wal-mart no longer carries the color I've been using, Red Heart French Country. I just found it online for around $8-9, but I just can't pay that when I've only been paying $3 or so to Sam. We just got a Joann Fabric store, so maybe I should check there? 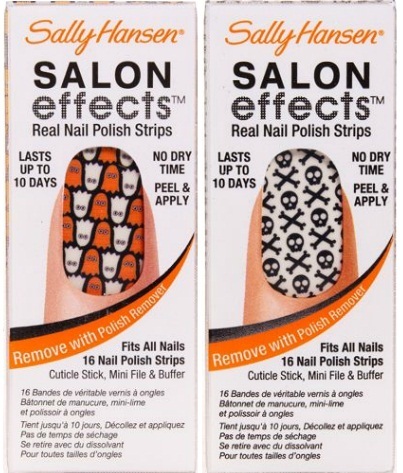 And being a good Chi O, it's imperative that I have the skull and crossbones nail polish strips for Halloween this year! And the ghosts are so cute too! I've checked my Wags and CVS, but they are so slow to put new things out, so I'm not all that hopefully. Maybe I'll check Ulta? French Country.... I'll let you know if I see it on any of my yarn-looking expeditions!